Progress is continuing on the Feelin’ Groovy baby sweater. For a bit, I dipped into the realm of Masochistic Designing regarding how to attach the faux pocket tops to the front of the sweater. It had almost become existential angst until I decided to try a three-needle join. 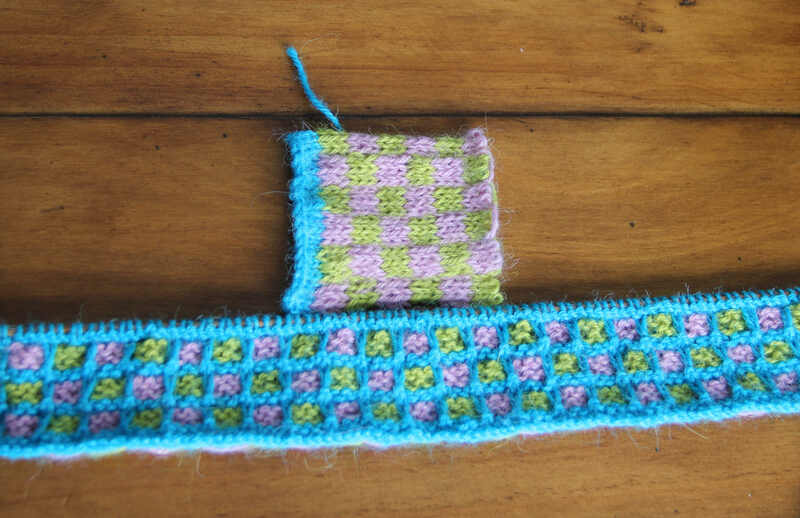 A three-needle join is exactly like a three-needle bind off except the bind off move isn’t performed. The three-needle join worked like a charm. I nearly spent a full 15 minutes in a blissful state of accomplishment until I started worrying about whether the faux pocket tops were the right distance apart. That led to worrying about whether they were positioned in the right places vertically. The gnawing question: Were they where pockets should be? 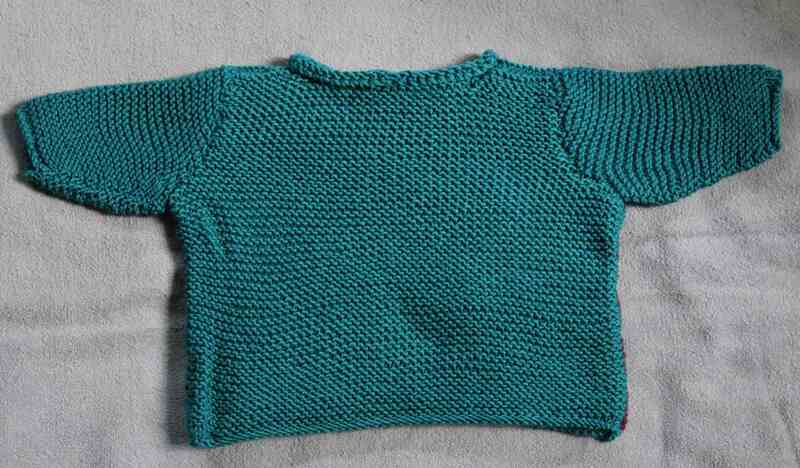 Or once the remaining top of the sweater was completed would they look misplaced? Would the entire thing need ripping back to reposition them? And then the ultimate existential question: Why did I design this with pockets anyway? Hence the rest of the night was spent in masochistic design mode. After every row I’d lay out the front to see if the faux pockets looked funny. With the decreases for the armholes complete it was time to add to my anxiety turn to inserting the button placket. The placket is normally in the middle of the garment. Though I had found and marked the middle stitches in order to place the faux pockets at the appropriate distance apart, I now worried that once the placket was created it would make the pocket placements look off. Thankfully, I realized that I was getting ahead of myself. My most immediate worry need was to remember which side the buttons go on for a girl’s sweater. 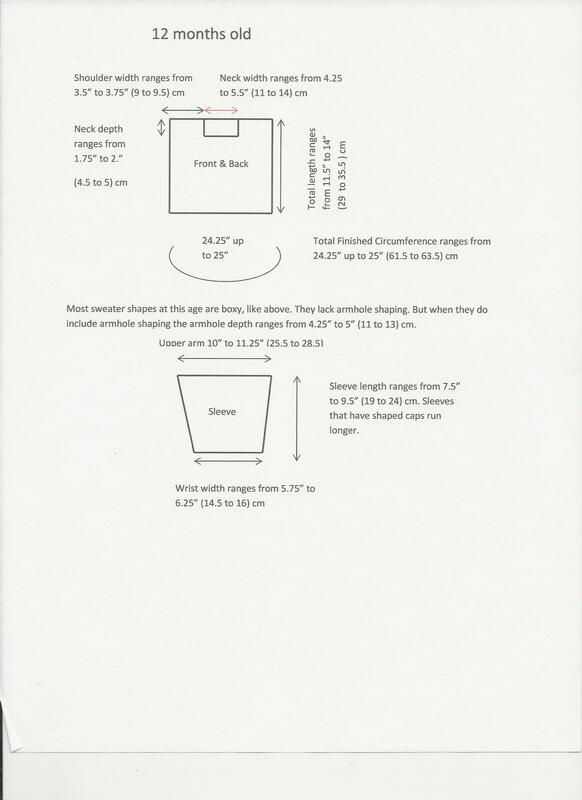 The placket couldn’t be started without knowing this first. Looking back, perhaps the easiest way of solving that little dilemma was to just ask Google. Instead, I turned to my ever expanding library of knitting books trying to remember which one contained the information I needed. I knew I read it in one of them. I remembered I even thought of marking the page with a sticky note that protruded from the book and said “button placement info” on it. For some reason, however, I never did that. Let’s just say the search was lengthy. I scanned through my pattern collection instead looking for a cardigan that would show the side the buttons go on. Armed with that information it was back to knitting…more or less. Before I could pick up the needles again, I needed to know the distance between each buttonhole. I remembered the book that should have had the “button placement info” tab sticking out of it gave the distances, but I wasn’t going back upstairs to look through everything again when I couldn’t find it the first time. I put the knitting down and called it a night. Next time I will write about button placement and how to figure it all out. The Back of the Feelin’ Groovy baby sweater is almost done. It became the Back when I reached the armholes and still had not settled the debate in my head as to the type of neckline. A large part of me still wants to go with the mandarin collar, even though the question has been raised as to whether a collar that stands up on the neck would be itchy. Of all the reasons against using this type collar that one never crossed my mind because if I am knitting a baby item I am using the softest yarn available. I have a very sensitive neck when it comes to fabric touching it. So sensitive in fact that I have spent my life carefully cutting off the tags they put on clothes because they bother me. Yet I have never had an issue draping a knitted shawl or scarf around my neck because I use the softest yarn out there. When I am designing baby clothes I use yarns that are soft and gentle. Some are specifically made for baby clothes such as Sublime’s Baby Cashmere Merino Silk, or the Debbie Bliss line of baby yarns. If I am not using specific baby yarn I look for one that is made up of alpaca, merino, cashmere, silk, any combination that is soft enough not to irritate little necks. The yarn I’m using for Feelin’ Groovy is made of alpaca. I love the drape, the way it knits, the way it looks when it gets worn, and I love its softness. I could wear it around my neck all day. One of the serious drawbacks in designing this sweater with a mandarin collar is it limits the size range. Babies from newborn to 6 months have no necks. So sizes 3 months, 6 months and even 9 months are out. While a 9 month old does show neck development, it is not enough to comfortably wear a mandarin collar. Thus I limited the sizes to 12 months, 18 months, and 2 years. I am toying with the idea of adding a 4 year old size, but I am not sure yet. Altering the neckline to a collar that lays flat would give me the 3 month to 2 year range I like to design for. I have made a number of sketches with alternative necklines and while a flat rounded neck would look nice, it throws off the placket I had planned. Frankly, without the placket and its buttons the design just isn’t the same. It loses the child-like, innocent, playful feelings I want to convey. I like my designs to convey some emotions and I specifically put colors, shapes, and fabric together to achieve those things. I still have time to worry over the collar. I’ll be starting the Front tomorrow. By the time I hit the start of the armhole I hope to have put the issue to rest. Running around the internet this morning and this caught my eye. Yes, Barbie. Only this time the toy company is releasing more realistic versions of the icon. But what truly got my attention was not the announcement that the doll may have a more realistic figure, but the dress the red haired doll second from the right is wearing. Recognize those colors? The colors look great on a red head. Who’d have thought? Somehow I forgot to add this size to the rest of the baby size and measurement posts. You can find all the baby sizes under Schematics Baby Sizes on the sidebar to the right. 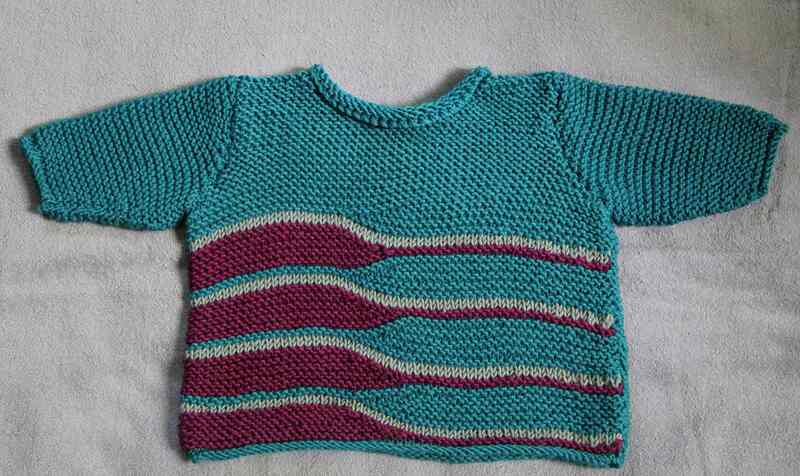 My latest baby sweater will be ready for the test knitters as soon as I finish typing up the pattern. For now here are some fast pictures I snapped. Watching the fashions on the runways, I loved the non-stripe stripe. Breaking out of a stripe being a long, thin or wide, line that went across an entire garment, I decided to play with the idea a bit. For that I turned to the ultimate in stripe sweaters the Rugby sweater as my template. The only other overly striped garment that comes close is vintage prison garb. 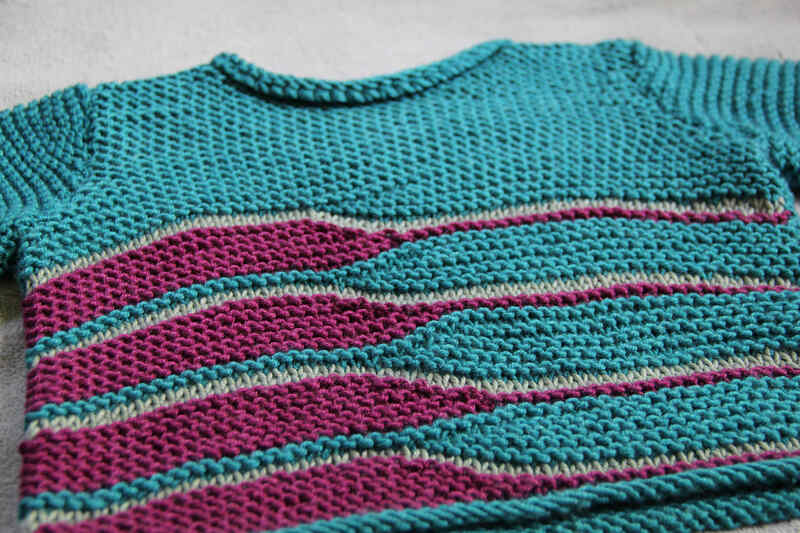 I decided to learn how to play with the width of the stripes while maintaining an even length across the bottom of the garment at all times. That took some math and a whole lot of knitting, ripping, and knitting again. I was working in a heavier weight yarn than I am used to, but the heavier weight gave me more options when it came to breaking off the striping. Since this is a sporting sweater, I went with slim rolled hem, neck and cuff lines. 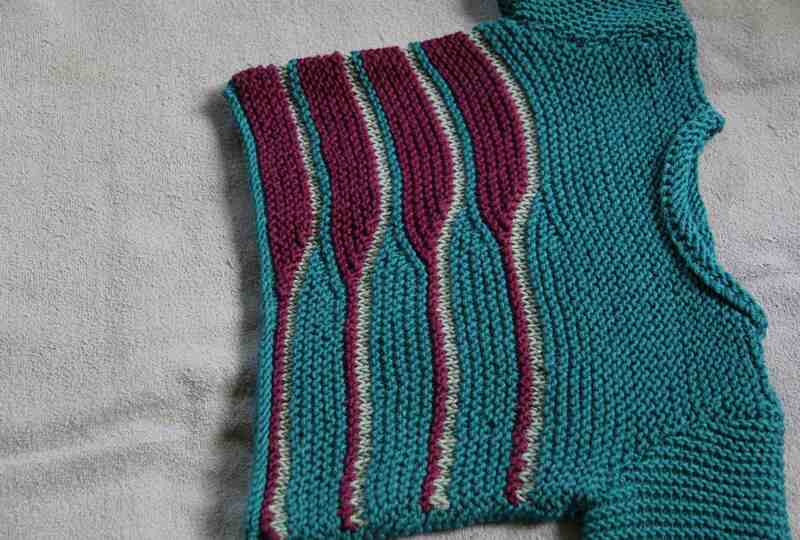 Deepening the neck depth offered me the opportunity to eliminate the usual buttons one sees on baby clothes around the neckline. The way the neck is worked provides more than enough stretch for it to easily slide over the child’s head. The weight of the yarn makes it appropriate for the autumn and winter months. On the back side of the sweater I gave myself and the knitter a break and made it plain. I can’t tell you how many times the front of the sweater was knit, ripped, and knit again. I lost count after week three. But giving birth to an idea is never easy, it seems.